Khyber Girls Medical College (KMC) Hayatabad Peshawar Khyber Pakhtunkhwa. 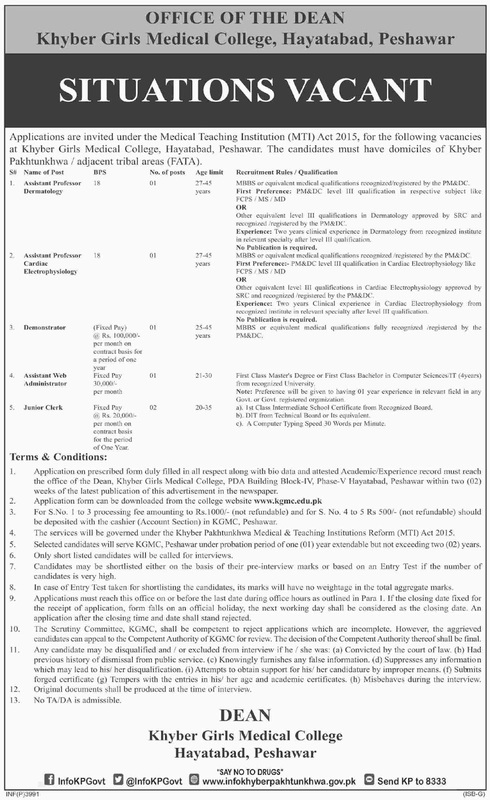 Applications are invited under the Medical Teaching institution (MTI) Act 2015, for the following vacancies at Khyber Girls Medical College, Hayatabad, Peshawar. The candidates must have domiciles of Khyber Pakhtunkhwa / adjacent tribal areas (FATA). Another equivalent level III qualifications in Dermatology approved by SRC and recognized registered by the PM&DC. Experience: Two years clinical experience in Dermatology from in relevant speciality after level III qualification. Another equivalent level III qualifications in Cardiac. electrophysiology approved by SRC and recognized/registered by the PM&DC. Experience: Two years Clinical experience in Cardiac Electrophysiology from a recognized institute in relevant speciality Idler level III qualification. MBBS or equivalent medical qualifications fully recognized /registered by the PM&DC. First Class Master's Degree or First Class Bachelor in Computer Sciences/IT (4years) from recognized University. a) 1st Class Intermediate School Certificate from 'Recognized Board. b) DIT from Technical Board or Its equivalent. c). A Computer Typing Speed 30 Words per Minute. 1. Application on prescribed form duly filled in all respect along with bio-data and attested Academic/Experience record must reach the office of the Dean, Khyber Girls Medical College; PDA Building Block-IV, Phase-V Hayatabad, Peshawar within. Two (02) weeks of the latest publication of this advertisement in the newspaper. 3. For S.Ne. 1 to 3 processing fee amounting to Rs.1000/- (not refundable) rind for S. No.-4 to 5 Its 500/- (not refundable) should be deposited with the -cashier (Account Section) in KGMC. Peshawar. 4. The services will be governed under the Khyber Pakhtunkhwa Medical & Teaching Institutions. Reform (MIT) ACT 2015. 5. Selected candidates will serve KGMC, Peshawar under probation period Of one (01) year extendable but not exceeding two (02) years. 6. Only shortlisted. will be called for interviews. 7. Candidates may be shortlisted either on the basis of their pre-interview marks or based on an Entry Test if the number of candidates is very high. 8. In ease of Entry Test taken for shortlisting the candidates, its marks will have no weightage in the total aggregate Marks. 9. Applications must reach this office on Or before the last date during Office hours as outlined in Para 1. If the closing date fixed for the receipt of the application, form falls on an official holiday, the next working day shall be considered as the closing date. An application after the closing time and date shall stand rejected. 10. The Scrutiny Committee KGMC shall be competent to reject applications which are incomplete. however, the aggrieved- candidates can appeal to the Competent Authority of KGMC for review. The decision of the Competent Authority thereof shall be final. (a) Convicted by the court of law. (b) 1-lad previous history of dismissal from public service. (c) Knowingly furnishes any false information. (d) Suppresses any information which may lead to his/ her disqualification. (e) Attempts to obtain support for his/ her candidature by improper means. (g) Tempers with the entries in his/ her age and academic certificates. (h) Misbehaves -during the interview. 12. Original documents shall be produced at the time of interview. 13. No TA/DA is admissible. Khyber Girls Medical College Hayatabad, Peshawar.